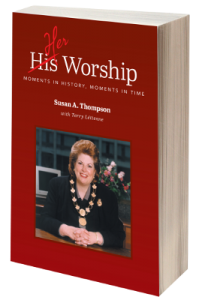 is the story of Susan A. Thompson’s moments in history, moments in time. People with an interest in politics, diplomacy, Canadian life, women’s issues, business and unique and interesting lives, will find this instructive, entertaining and beautifully expressed biography an enormous treat. And beyond the casual reader, it could serve as a virtual How-To for aspiring mayors. It is the story of a great Canadian life, told beautifully. Do you want to be inspired to reach for your dreams too? Click the link below to order online your own copy of Her Worship. We wrote this book, in part, because it was important to capture the making of history. As Winnipeg’s first woman Mayor, I broke through the proverbial glass ceiling at the City of Winnipeg government level. The fact that I am still the one and only woman…so far… to have become mayor of Winnipeg now makes this book a “call to action” in the hopes of inspiring other women to take on this leadership role. It is my hope that this book will resonate with all readers that what seems impossible is possible; that what seems to be “just a dream” can be a reality and that, yes….life does have the good, bad, and ugly…many times over…BUT…that you must always be open to the possibilities that life has to offer you. Not long after Susan Thompson became Mayor of Winnipeg in 1992, she was given official documents to sign. She immediately noticed “His Worship” printed on all the documents, to the left of where she was to sign her name… not “Her/His” Worship, just “His” Worship. Susan was taken aback that in this day and age, the document was printed in this manner. It was clear that absolutely no thought or consideration had been given to the fact that, at some point, the City of Winnipeg might have a woman as Mayor. She realized that if she requested a reprint of the documents, it would be perceived as an unnecessary expense… plus it would create “chatter.” So Mayor Thompson settled the matter by simply crossing out HIS with a red marker and adding HER instead… hence the title of this book! We would like to acknowledge the wonderful sponsors for this book. Without their support, this book could not have been published.